Prepare pasta: Cook pasta according to package instructions – make sure to cook al dente. Prep veggies: meanwhile cut all veggies and place in large bowl. Cut feta into cubes as well. Make the dressing: In a small blender or food processor, combine all ingredients for Greek dressing and process for about 10 seconds, or until smooth. If using garlic powder you can easily whisk ingredients in medium bowl. 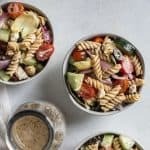 Make the Greek pasta salad: In large bowl with veggies and feta, drizzle on about 1/4 cup of the dressing then gently add about half of the pasta. Gently toss together before adding the rest of the pasta and dressing. Tossing again until veggies and pasta are well coated with dressing. MAKE AHEAD TIP: If making this for a party, prep veggies and dressing the day before so all that’s left is to boil the pasta. This also is a great meal prep salad if looking for a work lunch – the flavors intensify over 2-3 days. To make vegan simply omit feta. Store any leftovers in covered container in fridge – enjoy within 7 days.